Blended by Cigar Master Daniel Nunez and his careful dedication, it is ensured that each leaf of the Connecticut Broadleaf is left on the plant an extra 50% longer for a much bolder and darker taste. The mixture of Dominican and Mexican tobaccos within the filler is accented by the sweeter type of sun-grown tobacco used within the binder giving this cigar complexity on top of flavor. 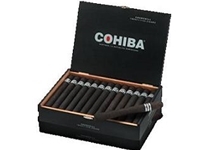 Not only has Cohiba created a luxurious cigar, but an affordable cigar!